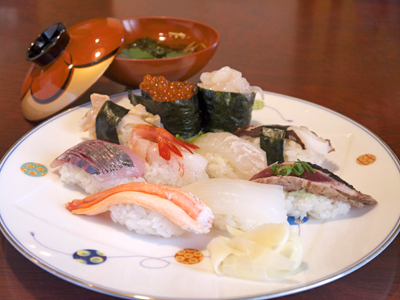 Located right next to the Toyama International Conference Center, this sushi shop serves the popular sushi sets and kaiseki meals to crowds of office workers at lunch. Taste fresh and seasonal local fish here. There is also a multitude of choices between the a la carte menu and the seasonal dishes. The popular items are fried glass shrimp, grilled babylon, chawanmushi, and homemade ichiya-boshi (fish that is salted, then dried overnight).